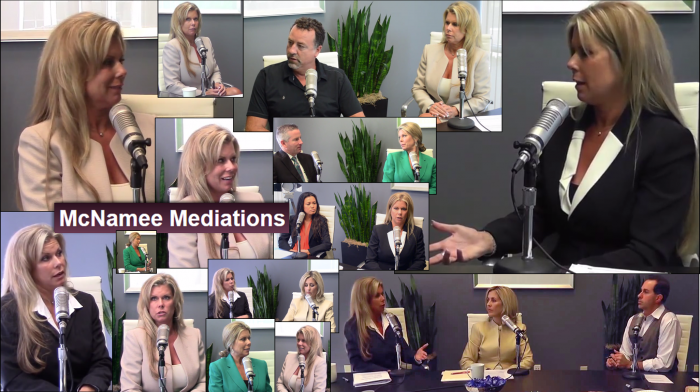 Learn more about divorce mediation in Orange County California through our video question and answers with Colleen McNamee. What Are Common Traits Of A Good Marriage? When Is Forensic Accounting Used In Mediation? How Many Divorces Are Caused By Finances? Is Mediation A Lot Less Expensive Than Litigation? What Is The Process Of Mediation Like? What Advice Do You Have For Young Couples Getting Married? Does Age Play A Part In Divorce? What Should A Divorced Home Maker Do With Her New Finances? How Do You Get People To Communicate When They’re So Hurt? Hi there! Today I want to introduce Colleen McNamee from McNamee Mediations and Colleen McNamee is somebody I’ve had on the show now a few times and I’ve been so impressed with what she does for a living and how many people she’s helped. I wanted to invite her on and really get to know Colleen a little bit more and find out what drives you and what built your practice to be as successful as it is. Is there Fairness in Mediation and Settlements? They get really frustrated with the amount of child support and they’re wondering. They feel like the wife is going to go live this grandiose lifestyle now and he’s going to be left living in a cardboard box just trying to make ends meet. Orange County, in general, has a high divorce rate and I’m wondering if the age plays a part at all or, the two things I want to kind of try and look at it, do younger people tend to get divorced quicker, I guess, or get divorced vs older people when you get married at a later age? How do you get them to communicate? What is mediation? How does it differ from litigation? So, in mediation, you, as the couple, come in and you jointly retain me to represent both of you rather than of retaining independent attorneys. So, we don’t have independent attorneys. Typically, in a mediation situation, I’m working with the couple as a neutral facilitator and I’m an advocate for both parties. So sometimes people will say “Do I need my own attorney to make sure that my rights are being protected”? Your rights are being protected by working with me; I’m just protecting both of you equally. It’s kind of a give-and-take and not sort of how we do the negotiating. The leading cause of divorce is? Oddly, or not so oddly, I would say that the leading cause for divorce in my opinion and the experiences I’ve had with my clients is a breakdown in communication which goes right hand in hand with what Jeff was saying. I think that the breakdown in communication can manifest itself in issues with finances, it can also manifest itself in seeking attention elsewhere and that would lead to affairs. Are you ready for some more staggering numbers? Well, you told me these already. So yeah, I want you to tell everybody else because these are crazy numbers. Okay. So I did a little more research just to see the kind of the number that would come in for 2013. In California, the average contested or litigated divorce cost a hundred thousand dollars per party. Primarily, I would say that most people will call me and say, “I think we can agree on things but we just don’t want to spend a lot of money on two separate attorneys. We’ve heard it’s really expensive and we would rather have the money left over for our children’s college plan or for us to be able to start our new lives individually. And then I also offer something called a premarital workshop which is unique because I address things from a legal perspective rather than a psychological perspective on how to avoid legal obstacles that could rise down the road once you get married. What is mediation like for the client? You know, truly, I was nervous. I had no idea what I was walking into; but, it was great. It was a table, Colleen was in the middle, my ex-wife on one end, me at the other. It was very professional but it was also kind of a relaxed atmosphere. I don’t know. Colleen’s personality helped it to be that way. It was comfortable. It wasn’t, you know, as scary as I thought; and she does, she lays it out. She lets you know that she’s there for both of you. Contact McNamee Mediations now for inquiries.